Teacher confidence in the use of technology is rising incrementally. 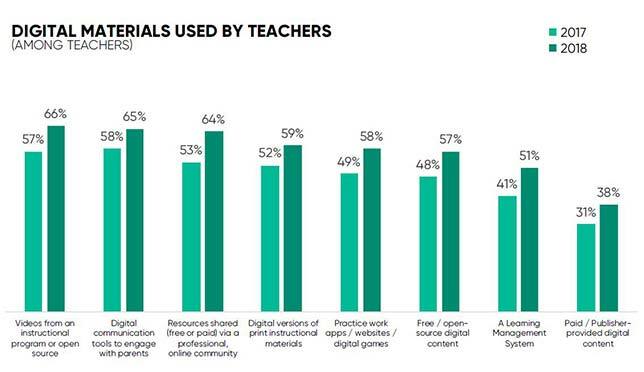 Some 99 percent of teachers and school leaders in a recent survey reported that they're using digital technology in their classrooms. And nearly as many (96 percent) said they've seen benefits from its use. The survey was conducted among 1,281 teachers on behalf of Houghton Mifflin Harcourt by public opinion survey company YouGov. The goal of the survey was fourfold: to understand where educators are feeling both optimistic and concerned about the state of their profession, how they use technology and what they perceive as its impact, what kind of professional development they get to prepare them for the use of digital learning resources and how equity is playing out across districts with and without sizable achievement gaps. When asked about the use ed tech in their classrooms, 95 percent said they were confident in their abilities to use it, compared to 94 percent in 2017. However, those expressing extreme or high confidence has shrunk over that same period, from 62 percent to 58 percent. Confidence was highest among less experienced teachers; while 64 percent of those with 10 or fewer years of experience said they were extremely or very confident, 58 percent of those with between 11 and 20 years said the same, as did just 49 percent of those with 20-plus years in the field. An improved ability for students to access their lessons "anytime/anywhere" (50 percent). Improvements in student achievement were cited by just a third of survey participants (32 percent). Among the digital materials in use, videos rank highest; 66 percent of respondents said they were using those in 2018, compared to 57 percent in 2017, followed closely by digital communication tools for engaging with parents (65 percent) and resources shared on professional communities (65 percent). People working in high-poverty schools said the main barriers they faced in using technology effectively were primarily a lack of access to computing devices or internet access outside of the classroom (54 percent); this was selected by only 22 percent of respondents in low-poverty schools. Nearly half of high-poverty school teachers (48 percent) also said they lacked devices for their students in the classroom (compared to 31 percent among low-poverty school educators). As a result of lack of computing resources, high-poverty schools were less likely to use digital communication tools (73 percent), apps for practice homework or digital games (62 percent) or a learning management system (57 percent). Teachers are still an optimistic bunch. Fifty-three percent said they were either very or somewhat positive about their work, compared to 41 percent in 2015, 44 percent in 2016 and 50 percent in 2017. As one teacher told the researchers, "There has been an increase of ideas and solutions to problems in my current district. Collaboration between colleagues and with the community has increased as well." Yet, most of those with at least five years of experience also said they feel more negative about their profession than they did five years ago (cited by 54 percent). Among the 16 percent who reported feeling more positive, their outlooks were strengthened by a change in their individual situations, increased access to the use of tech and increased "autonomy and excitement" in the learning process. Among top concerns, however, were these three: low salaries (mentioned by 69 percent); an overall lack of funding (60 percent); and keeping schools safe from intruders and differentiating instruction for special student populations (both with 42 percent). Among those who specifically wouldn't rule out a teacher strike in 2019 or later, the top reason was teacher salaries (designated by three-quarters of respondents), followed by funding policies (39 percent), lack of respect from elected officials (36 percent) and concerns about safety from violence (31 percent). In spite of the recognizable benefits of tech use in the classroom, these educators still considered the human connections most important of all. Ninety-four percent of respondents said the connection between teacher and student was important for ensuring student success; and 95 percent said teacher support and engagement of students' families was the ticket. The complete report of results is available with registration through the Houghton Mifflin Harcourt website.